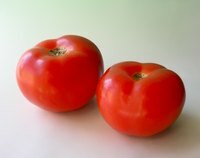 Ohio is the second leading commercial producer of tomatoes in the United States, behind California, and the tomato is the official state fruit. In Ohio, tomatoes are planted as transplants because they require warm temperatures over a long growing season. The last spring frost date in central Ohio is around May 20 and tomato seedlings can be planted anytime after this date. The state's home gardeners are more likely to have success with tomato plants when they choose cultivars known to flourish in Ohio's climate. Both the Ohio State University Extension and Mother Earth News recommends 'Roma' for Ohio. 'Roma' tomatoes are used popularly in Italian dishes and have a meaty, dense flesh with a low moisture content. The tomatoes are not round or circular but egg or pear shaped and contain very few seeds. The color of the tomatoes is deep red, reddish-orange or reddish pink. The mature size of 'Roma' tomato plants is under 4 feet tall and produce nearly all of their fruit at the same time. The tomatoes mature 70 to 80 days after transplanting. 'Early Girl' is one of the best varieties for short-season gardens like Ohio according to Mother Earth News. 'Early Girl' is an indeterminate (tall-growing) variety and plants need to be supported as they grow. The tomatoes take about 52 days to mature after transplanting. Recommended time to transplant is during late spring when the weather has warmed. The tomatoes are uniform round shaped and have a sweet, fresh flavor. Like other indeterminate varieties, 'Early Girl' plants produce tomatoes all through the season. The early maturation of this is a plus point for the cooler Ohio climate. 'Sungold' cherry tomatoes are a good choice for Ohio gardens as these are among the early-season varieties, according to Cornell University Extension. The tomatoes take about 57 to 60 days from transplant to maturation. The indeterminate plants grow as vines and reach a mature height of 3 to 5 feet. The oval to oblong shaped tomatoes are 1 3/8 inch by 7/8 inch and are meaty in texture. The color of 'Sungold' is golden-orange and the vegetables have very few seeds. The variety is good for field or greenhouse production. 'Sungold' is resistant to tobacco mosaic virus and fusarium wilt. 'Jet Star' is an early season variety with high yields and maturation time of about 72 days. The plants are indeterminate and grow as sturdy, sprawling vines that need the support of stakes to grow well. The plants produce heavily and continue to flower and set fruit until the first autumn frost. All these properties make 'Jet Star' a good pick for Ohio gardeners according to both the Ohio State University Extension and Mother Earth News. Henry Field's Seed and Nursery Co., describes 'Jet Star' tomatoes as flat, large globes, generally free from scars and cracks. The color is a deep red both inside and out and the tomatoes have a sweet flavor. This variety is resistant to fusarium wilt and verticillium wilt. 'Juliet' is recommended variety for the Ohio region by Mother Earth News as well as by Backyard Gardener.com. The tomatoes are an early season variety which takes about 80 days to mature. 'Juliet' tomatoes are oblong, sweet and grow in clusters. The variety has a good tolerance for humidity and heat and can be planted to achieve either an early spring or late summer harvest.